I recently completed Essential Design Principles for Tableau offered by the University of California Davis on Coursera. I’ll offer some review commentary. I thought it was a solid class as it covered data visualization concepts such as pre-attentive attributes and the Gestalt principles. This class was a bit more heavy on the conceptual side of the house as opposed to delving into practical Tableau instructions. However, there are other classes in the specialization that have a more hands on practical approach. In this assignment we had to highlight the three worst performing product Sub-Categories in each region. Additionally, we had to demonstrate how these worst performers compared to other product Sub-Categories in their respective regions. Finally, the visualization had to highlight the three worst performing Sub-Product Categories overall with a color emphasis. The scenario given to the class was that a sales manager had to cut the three worst performing Sub-Categories in her region and needed a visualization that addressed her concerns. Profitability is closely related to profit, but it is the metric used to determine the scope of a company’s profit in relation to the size of the business. Profitability is a measurement of efficiency – and ultimately its success or failure. It is expressed as a relative, not an absolute, amount. Profitability can further be defined as the ability of a business to produce a return on an investment based on its resources in comparison with an alternative investment. Although a company can realize a profit, this does not necessarily mean that the company is profitable. For these reasons I used the Average Profit Ratio of the products in each Sub-Category as my KPI as opposed to raw profits. If you had to sell $100,000 of product A to make $1,000 in profit (1% profit ratio), would you eliminate product B which requires $1000 in sales to generate $500 in profit (50% profit ratio)? Only if you want to go out of business! 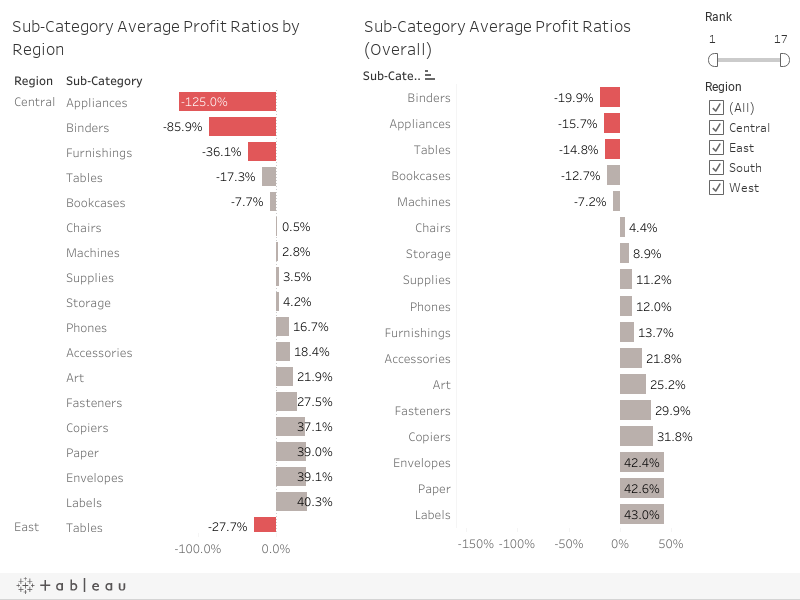 In order to complete the visualization you see above on Tableau Public I had to incorporate nested sorting principles and also highlight the three worst performing elements on a bar chart. Luckily for you, I have videos that will demonstrate how to accomplish these tasks. You can check out the rest of my videos on my Youtube Channel or find them on this site under Videos.